Another long drive from Dorset on a cold wet December evening this time to Chichester to view the selected finalists for the fifteenth National Open Art Competition, held at The Minerva theatre. I admit my mood was not as elevated as it has been on previous occasions. Maybe I am becoming blasé about attending private views; having been to so many over the last couple of months! Can you have too much of a good thing? I felt slightly guilty for not looking forward to viewing my work up on the walls of another gallery…Ultimately I believe it was the short, dark December days and torrential rain that was dampening my spirits. As we climbed the stairs to the circular gallery placed opposite the small theatre that is also ‘in the round’ I admit, to my shame, I was not my usual cheery self. Being greeted by a friendly ‘hello, nice to see you again’ should have shaken me out of this dampened mood; but I did not recognise this man and walked straight passed collecting my catalogue as I entered the room. It didn’t help being one of the first to arrive; the vibrant chatter and excited glances of other artists and guests that was to build into a crescendo later was absent. We walked around the room in silence. I felt this was a different show to the Autumn Exhibition at The Royal Academy in Bristol or The London Group’s exhibition at The Cello factory that I had recently attended. The works were extremely varied both conceptually and contextually. I found it difficult to engage with some of the pieces; one could say this was cutting edge contemporary work, others may disagree. A few pieces I just thought ‘why’? A lot of the work was photographic all of which strangely seemed the most traditional in execution. I began to question whether it was my rather flat mood that was not allowing me to understand why some of these images had been selected; (only 100 artists out of over 2000 entries had got this far). I began thinking about Kant’s theories of perception made in his essay The Critique of Pure Reason in 1781. Kant basically stated that our perception of what we view varies on different occasions due to our personal experiences or sense of perception at that particular moment in time. So maybe this was an explanation as to why my perception of this work was not as it might have been on a different occasion…What to do? Time to sup some wine and sit awhile; to just watch and wait as the room filled with enthusiastic individuals. I started to mellow; the images around me took on new meanings. I couldn’t help but admit my admiration for the monochromatic X-rays by Nick Veasey, both his images Bowler Hat and Lanvin Dress entranced me by the inner beauty that had been revealed through his creative process. To illustrate such a delicacy that exists within a bowler hat, to be able to see through the object rather than just merely glance at its surface has revealed a metaphysical element to an inorganic artifact. 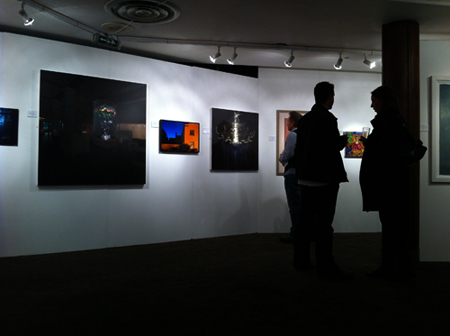 This image, Bowler hat, deservedly won 2nd price for The Amiri NOAC Photographic award. I had long been an admirer of his work and I was honoured to have my work selected for this show. I was now thrilled to view my image here; even though placed between two rather larger images the curation and lighting seem to make my photograph of an orange house shine as it did when I captured it at twilight, to take on an otherworldly existence. Time for a speech by the chairman of The National Open Art Competition; here was the man I hadn’t recognized as I had entered – This was Neil Lawson who later chatted tirelessly with my husband and me. He is a great man, at 71 charismatic and full of enthusiasm for all the art shown. I had met him previously when delivering my exhibit and he had remembered me. I profusely apologized for having not recognised him and secretly vowed not to let my moods allow me to be so dismissive of anyone again…You never know who they might be!